Releasing a film without a pre-screening for critics is usually a bad sign. A mid-February studio release is never good. You know what else isn’t good? Rings. If you’re wondering whether Samara’s story disappeared with the last VCR, puzzle no longer. Sadly, it did not. Indie hipsters at a garage sale take home some vintage equipment, find an old VHS tape inside and watch it. If you’ll recall, watching said video of freaky images condemns the viewer to death within a week. The images relate to the accursed life of, in the English language films, a little girl named Samara. Gore Verbinski’s 2002 The Ring managed to do two remarkable things. One: it surpassed its Japanese-language original (Hideo Nakata’s Ringu) in quality. Two: it was a deeply frightening PG-13 movie. But Verbinski has talent, as does his cast, most notably 2-time Oscar nominee Naomi Watts. 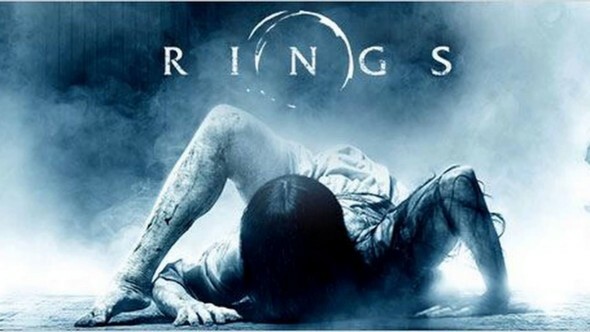 Rings director F. Javier Gutiérrez is playing without those kind of all-stars. At this film’s heart is still that Scooby-doo mystery to solve that is the foundation of nearly every ghost story – and Samara’s tale is essentially that. In this episode – which forgets 2005’s The Ring 2 ever existed – two college freshmen do the sleuthing. The leads are, as far as I can tell, made entirely of wood or wheat toast. Matilda Lutz is Julia the Bland, devoted girlfriend and courageous ghost hunter. Her boyfriend Holt (Alex Roe – yawn) participated in a wild psychological experiment led by his professor Gabriel (Johnny Galecki) – garage sale junkie. That experiment leaves Holt with 7 days to live…and his time is almost up. The film’s running time isn’t, though. Oh, no. Holt’s fate is revealed and we still have at least 3/4 of the movie to suffer through. Sadly, the genuinely talented Vincent D’Onofrio gets dragged into this at a certain point, his only real contribution is to remind the audience what acting actually looks like. Why do I get my hopes up?